Cycling is a liberating experience. It lets you travel places in a healthy way with no fuel expense. However, many parents find themselves stranded because they have a child at home who can not ride and they do not want to leave him or her alone. Installing a child carrier on your bike can be the perfect solution for a parent who wants to ride away with no worries on the back of the head. 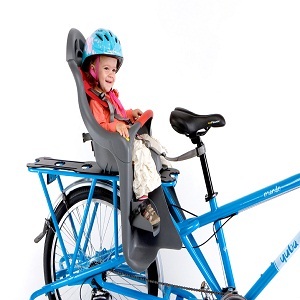 Child carriers are easily available in bike shops and all you have to do is to install it on your bike using the given bolts. Go through steps for better understanding on how to install a child carrier on a bike. A child carrier comes with two parts. One is the rack and the other is the seat. You have to attach the rack first on the frame of the bike before placing the seat on it. Use the given bolts to attach the rack to three points on the bike. One is right below the bike seat to the bike frame, the other is to the spoke support on the back tire and the third is on the alternate side of the back tire. Remember this is for a child carrier that is installed on the back. For the front you will have to attach the frame to the front tires instead. 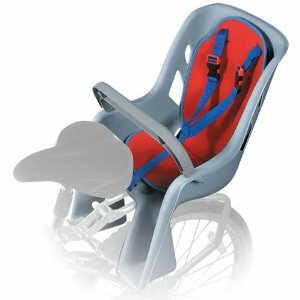 Before inserting the seat unto the rack, place your child in it and ensure that he fits in snugly with the help of the harness system. Adjust the straps so that the child is not loose enough to fall and not too tight to feel uncomfortable. Remove the child before continuing. Place the seat above the rake. Slide it over the rake, with the front facing the direction of the bike. The seat will slide into the rake and click into place. Secure the seat to the rack with the given screw. Now make sure that the seat is attached to the bike firmly by pulling on it. Place your child in the seat carrier and adjust the harness. 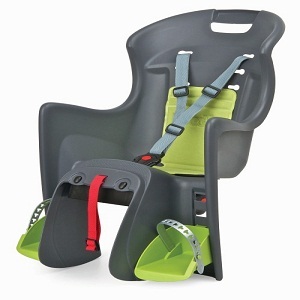 Make your child comfortable by adjusting the foot rests and gripping bars. There is a V that Time to take a ride but with a safety helmet for the first time.